It took two years for the creation of the castle to be completed. Soon after construction was finished, Edward Tovrea, who owned land surrounding Carraro’s, opened a meat packing plant nearby. Not happy with Tovrea and other adjoining landowners bring in livestock; Carraro sold the property, along with its remarkable structure, to Tovrea and his wife Della in 1931. In 1932 Edward Tovrea passed away and Della decided to keep the castle as her permanent home. After she married William Stuart, it became a winter home until after his death. She again lived at the residence full-time until her death in 1969. After her death, the Tovrea family trust was in charge of the property but neglected any maintenance that was needed causing the place to simply diminish over time. The once beautiful desert gardens were now dying and ignored with the cacti suffering the most damage. Also the deserted castle was in poor shape making the structure unlivable. 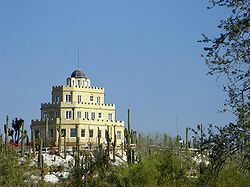 In 1993, the City of Phoenix obtained the land and its wedding cake building deeming the place as a historical structure. In 1990, Tovrea Castle and its surrounding land were listed as a historical property and in 1996 added to the National Register of Historic Places. The castle has been going through restoration while the gardens are being restored to their former glory. Tovrea Castle was to be giving tours and opening its doors to the public in 2009, but because of the economical issues, it has been delayed. Sharon and I are looking into touring the place. As soon as we do, we will share our pictures, videos and story. BTW, I hear the place may be haunted. wow! i had not heard of this place! I have driven by this castle for many years and can't wait to see the inside. I'm very jealous you get to go inside. I used to think that was one of the neatest sights Phx had to offer, but I never got to go in. My friend Bill did once. He never failed to rub it in my face. Hope you enjoy! I don't know when we are going to tour the place, but you know me, I will take lots of pictures. I know. I've had my eye on that place a long time. Cannot wait to get inside. I think the construction and the land it sits upon is very promising haunt wise, not to mention it's high rise area made it an ideal lookout for the Indians of the area back in the day, who wanted to see who was entering The Valley of the Sun. It has an eerie feel to it as you drive by because it is all alone, sitting on a hill, in the middle of a fenced in desert landscape. Very cool story about that place. Always enjoying hearing the history around unusual aritecture. It definitely catches your eye when you are driving around east Phoenix. Cool place! I can't wait to see your pictures. 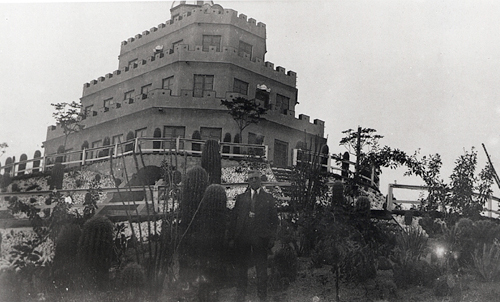 I was born & raised in AZ and have been looking forward to the day they give internal tours of Tovrea Castle. Last I heard they were only selling admission to the cactus garden surrounding the building.